Green structures are gimbal mechanisms designated 2D4100 and built at KB Arsenal in Leningrad (now St. Petersburg). They tilt combustion chambers steering the rocket along its flight trajectory. 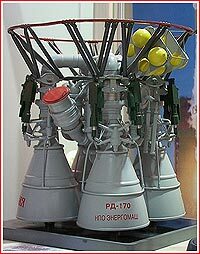 The torturous development of the RD-170/171 series continued from 1976 to 1987, presenting some of the most serious challenges before engineers at Moscow-based NPO Energomash led at the time by Valentin Glushko. The first test firing of the engine took place on Aug. 25, 1980. Between 1981 and 1983, various problems plagued test firings. One of the botched tests at NPO Energomash test facility on the outskirts of Moscow reportedly ended with a massive explosion that sent a heavy metal cover of the troubled engine's turbopump several miles away concluding with an impact on the runway of Moscow's main international airport in Sheremetievo! There were even proposals to replace troubled RD-170 with one-chamber NK engines from the first stage of the N-1 rocket. However in the end, all problems were resolved and one of the engines made 18 full-length firings logging a total of 2,520 seconds on the test stand. 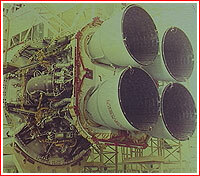 The engine was first used on the Zenit rocket in 1985 and then on Energia in 1987. On Dec. 5, 2013, NPO Energomash conducted 1000th firing of the RD-171M engine at the company's test bench, NIK-751. However at the beginning of 2019, NPO Energomash said that RD-171 engines had gone through a total of 900 tests with a total firing time exceeding 100,000 seconds (27.7 hours). According to the company, one copy of the engine performed more than 20 firings without its removal from the test bench. 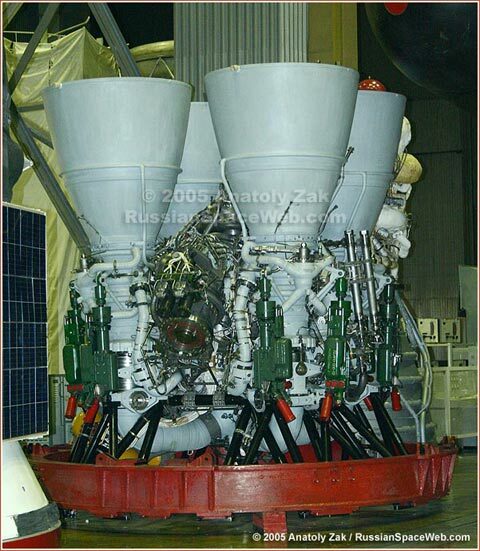 In 2017, Director General of RKK Energia Vladimir Solntsev referred to a "simplified" and "cheaper" version of the RD-171 engine in connection with the Soyuz-5 (Sunkar) project. RD-170 during assembly in 1980s. 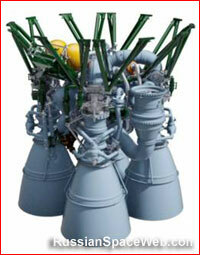 A possible depiction of the RD-171MV engine.